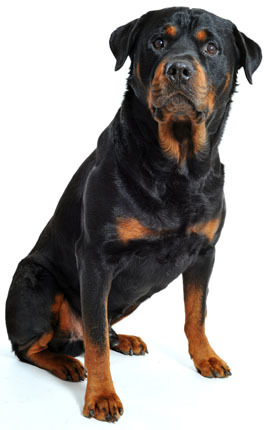 Learn about the temperament and personality of the Rottweiler. Discover what he's like to live with, his traits and characteristics and how he generally behaves. And look at lots of Rottweiler photos. The Rottweiler is loyal, self-confident, calm, courageous, independent, wary, and protective. He's an instinctive guardian known as the world's best guard dog. He's tough, strong, and powerful and possesses a lot of endurance. He's territorial and protective of his home and family. He does not make indiscriminate friendships with strangers. He's cautious, watchful and aloof with strangers until he's properly introduced to them. He can be aggressive with others dogs, so you'll have to keep an eye on him because the other dog could be injured. He thrives on your companionship and wants to be around you always. He's fond of children and protective of them. He's extremely intelligent and learns very quickly. He can be quite a clown around his family, which can be entertaining to watch. While he makes an excellent guard dog he isn't the best watchdog because he may not bark much. There are many other breeds which make better watchdogs. But he's the ultimate guard dog! He's one of the top 20 most popular dog breeds in the United States. The Rottweiler is the most intelligent and easiest to train of all dog breeds! He learns new commands quicker than any other breed, which makes him very easy to train. The Rottweiler sheds a fair amount of hair. You'll find hair stuck to your couch, carpets, clothes and everything else in your home.